Gunilla of Sweden (AKTA® ) is educated on the ABCs, that’s Active Botanical Compounds! They use organic botanicals for increased effectiveness and no fillers like water and/or pore-clogging oil. This means you will see great results from their products in a minimal amount of time. Even if you think the price is a little higher than your over-the-counter pharmacy brands, the products are so concentrated and so effective, you will actually save money! For my oily/combination skin, there is nothing better to reduce skin problems and put a halt on lines and wrinkles. Here’s a little about the Gunilla of Sweden products I love. Start with a wash; AKTA Herbal Face Wash is a purifying daily cleansing gel that boasts more than a dozen all natural and organic active ingredients. It gently cleanses and purifies skin while preserving it’s PH moisture balance, so your skin is clean, soft, and not stripped. This wash has a great, light scent that makes your skin feel totally rejuvenated. After cleansing, I like to use a toner to open up my pores and prepare for my next serum. AKTA BalancingToner, like all Gunilla products, has 100% organic ingredients, plus a multitude of antioxidants, anti-inflammatory and anti-bacterial properties. By removing flaking and dead skin cells, this refreshing peach toner adds moisture as well as prepping skin for further treatment. My treatment of choice is AKTA 10% Alpha Hydroxy , a very effective solution for oily, blemished and problem skin. It exfoliates dead skin cells and keeps pores healthy, clean and actively prevents future breakouts. And as a bonus, since I’m not getting any younger, Alpha Hydroxy is critical for the production of healthy skin cells that minimize fine lines and wrinkles. Used daily, this formula gradually exfoliates dead skin cells to improve texture and clarity while revealing fresh, new and healthy skin. Sometimes with the use of different products, my skin can feel tight or even a bit dry in the winter. I am not a big fan of facial moisturizers but AKTA Cell Rejuvenator is light and effective. It has aloe vera to moisturize as well as collagen, elastin, and revitalin to decrease wrinkles and protect from environmental damage. And finally, I've always thought that the eyes were the tell tale factor when determining someone's true age but I found the secret AKTA Eye and Lip KRAM. It works to lift and firm the skin around the delicate eye area for a more youthful appearance and erases puffiness from last night's toddler sleep interruptions. Also, a little goes a long way so its very cost effective. It is no coincidence that we happen to carry all of these products in a well-equipped kit called the AKTA SkinCare Kit for Combination/Oily skin. There’s no need to guess, these products work so well together and really provide you with a perfect daily regime for both acne fighting and anti-aging. 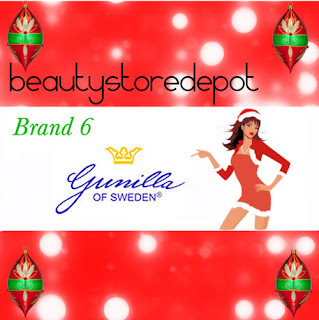 Gunilla of Sweden is our second featured brand this week and we are giving away an awesome kit that includes: Herbal Face Wash, High Content Balancing Toner, Cell Rejuvenator, and an Eye and Lip Kram. This kit is valued at $131! Don't forget to follow us on Facebook for all the info on how you can win this amazing kit, games, professional advice, samples, and so much more!